A kid with a graffiti habit - what could be a more stereotypically youthful image? From his humble beginnings in the South West of England, to an artist who is now one of the most respected figures in international street art – Beejoir is Addicted’s Artist of the Week. Beejoir - his artist name - was a childhood nickname that stuck. The other term by which he is often identified - the "Man with the golden spray-gun" - recalls his earliest days with a can of spray paint. But it would be quite wrong to suggest that the young man's destiny as a professional artist was an inevitable one. That may have seemed the case when, in what he described as "a bolt out of the blue", someone first requested that he paint and sell a canvas to them, but by then, he had already dabbled in occupations including dive instructor, coffin builder and barman. 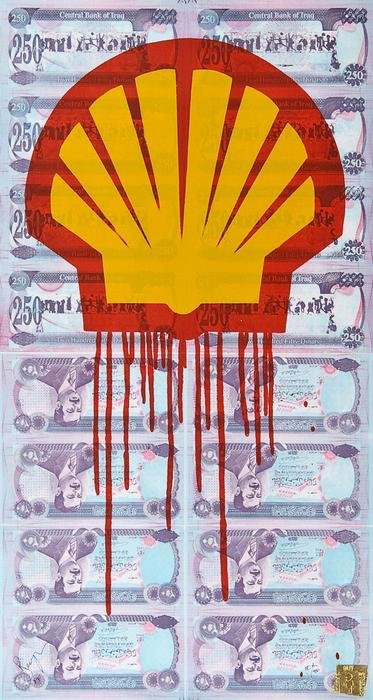 Before we explore Beejoir's 'rags to riches' story in more detail, it may first be instructive to take a closer look at his work - the paintings, prints, sculptures, photographs and stencils that show a clear satire of, and commentary on, the consumer culture and capitalism that the artist sees all around him. This is not an artist who shies away from the topic of human vice, or who has much positive to say about the Rupert Murdoch empire. Nor is he afraid of causing a little controversy in making such points, as demonstrated by hard-hitting images “LV Child”, “Money Trap”, “A Pill A Day” and “Shell Blood For Oil”. In 2015, he produced a large scale immersive installation, #NRCSSM, at the Bangkok CityCity Gallery. But of course, such strong interests weren't the "bolt out of the blue" that the artist's first canvas commission was, having been cultivated in part by his varied experiences around the world. Born in 1979, the young Beejoir quickly developed his resourcefulness through the production of compelling street art using vernacular materials and processes, already anxious to create art with a message. He went on to paint in both the UK and Europe, but perhaps his most momentous decision was to move to and settle in Asia in 2007, subsequently embracing a new lifestyle. The continent was far from new to the artist who had spent the late 1990s and early 2000s journeying around Europe, Africa and Asia, noticing the stark contrasts between overt affluence and crippling poverty, often in very close proximity. Such experiences only furthered Beejoir's already keen interest in human traits such as greed and indulgence, as well as the breakdown of community that can manifest from them. Today, the artist splits his time between the UK and Bangkok, Thailand, his varied surroundings producing plenty of fresh inspiration for work once memorably described as "irreverent" by Financial Times critic Rachel Spence. If one needed any further evidence to add to that already out there for the notion that the most well-travelled and world-aware artists thrive, they would only need to look to Beejoir's now incredibly successful and storied career. He has won the adoration of the global contemporary art market at high-profile auction sales at Bonhams and Phillips, exhibited truly worldwide in locations including Tokyo, London and the US, and even featured in a documentary on graffiti artists from Australia, Asia and the Middle East, 2007's Bomb It 2. 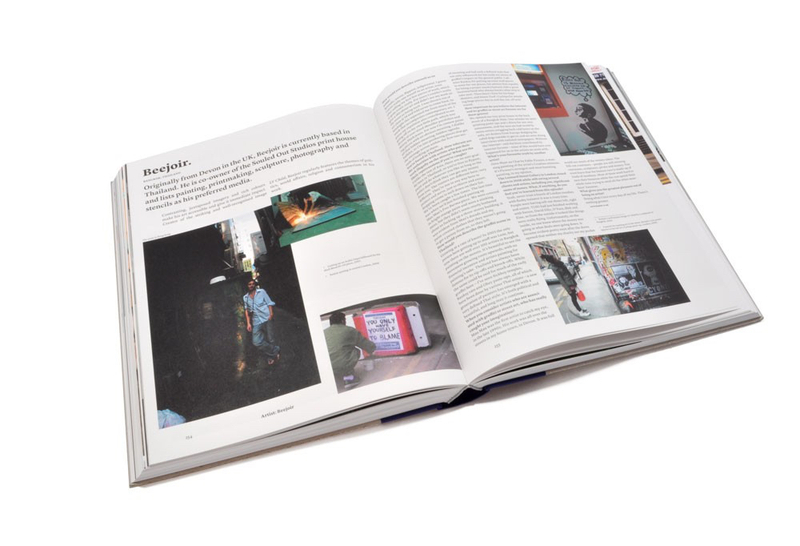 All the while, this entirely self-taught artist co-founded Souled Out Studios - now one of the leading publishers and supporters of street art in the world - in addition to appearing in academic papers and winning further recognition in the 2010 book Beyond the Street: The 100 Leading Figures in Urban Art. Central to Beejoir's success, however, has always been his artwork - the uniquely formulated, beautiful and powerful works that blend saturated colours with other, often contrasting visual elements that capture the viewer's attention, all while the inherent messages question modern societies' predominant cultures and ways of life. He continues to work with many of the leading artists of today's global street art scene, nurturing the next generation of urban creatives alongside his ongoing focus on his own artistic practice.